Does Christianity Affirm or Deny the World? Yes! Faithful Christian living involves a paradox: our faith is both world-affirming and world-denying. World-affirming in that we believe the world’s structures are fundamentally good, a part of God’s good creation now longing to be restored. World-denying in that we believe the world’s systems are pervasively evil, firmly opposed to God and His loving rule and awaiting His judgment. Careful Christian thinking holds these two truths in paradox, never allowing one truth to drown out the other, never allowing the extreme position of one side to lead us to the other. To miss one side of this paradox or the other is to distort the beauty of Christianity. Becoming Worldly Saints by Michael Wittmer pushes even deeper, reminding us that world-affirming and world-denying Christianity are two sides of the same coin. We won’t deny what needs denying unless we affirm what needs affirming, and vice versa. After all, we were made for this world. “We are earthlings, for heaven’s sake,” as Mike says so memorably. When God created Adam out of the dust of the ground, He put his feet back in the dust and gave Him a garden to cultivate. Humans weren’t made for heaven, but for earth. Or more specifically, heaven on earth — a world drenched in the presence of the Creator. Sin, of course, changed everything, so now the world in one sense is structurally a good thing that needs redemption and in another sense is systemically evil and needs to be purged and made right. The truth of the Christian gospel is that through faith in Jesus Christ, we are promised a new heaven and new earth, a place where righteousness dwells, where the new world — both structurally and systemically — is harmonious and purposeful. Those who know and love King Jesus will be with Him forever, not in a disembodied state of shadows, but in flesh-and-blood resurrected and restored bodies. Becoming Worldly Saints conveys truths that are essential for following Christ faithfully. Mike Wittmer doesn’t want us to lose sight of the world-affirming aspects of our Christian faith. He doesn’t want us to underestimate the power of living an ordinary life of faithful devotion to King Jesus. He doesn’t want us to feel false guilt for enjoying the good world God has given us. The truth of eternity doesn’t obliterate our earthly experiences; it infuses them with heavenly significance. Here is a book that gives testimony to our Maker and the good things He has made. One of the ways we enjoy Him is through them. The Father loves to give good gifts to His children, so that our love for His gifts will lead us back to His generous heart. 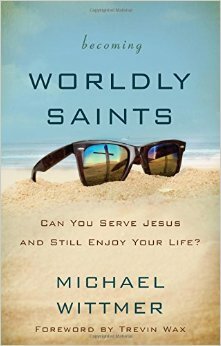 Mike wants us to be worldly saints. Not flesh-driven or sinful or backslidden, but worldly in the proper sense. Saints who live and move in this world — not denying or feeling guilty for our earthly existence, but who see the misdirected idolatry of the fall in this world and who long for redemption in all its glory.